Hojas dentadas de color verde. Planta muy resistente, alejarla de otras mas pequeñas o menos fuertes. 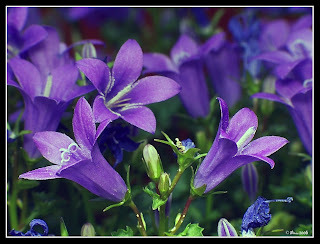 Campanula portenschlagiana 'Resholt Variety' Dalmation bellflower or wall harebell is an evergreen or semi-evergreen perennial which grows six to ten inches tall, with a one-foot spread its first year, eventually with continuous spread along runners. Several mounding clumps properly spaced can make a continuous groundcover of small heart-shaped dentate leaves. It may out-compete other groundcovers, & its potential for rampancy should be considered when deciding placement. Blooms begin appearing in late May or early June, are gung-ho all summer, & rebloom less intensely through the whole of autumn in our mild zone, right up to November. If it seems to be petering out at any time during summer, a light sheering will get it flowering again. It wants full sun but tolerates partial shade. It wants moist well draining soil. Clumps can be divided in autumn or just before spring.